1. To make the cheese slices, line a 2cm-deep, 20x30cm baking tin with baking parchment. Mix the cheese, Worcestershire sauce, English mustard, cornflour, yeast and Marmite. Place in the fridge for 2 hours. 2. Pour the ale into a pan, set over a medium-high heat and bring to a simmer. Slowly add the cheese mixture, a handful at a time, stirring until all of the cheese has been incorporated. Allow the mixture to come to a boil and continue to whisk until smooth. Pour into the prepared tin and leave to cool to room temperature. 3. Once cool, cut into 6 squares. Cover with clingfilm and chill. 4. To make the sauce, place the ketchup, mayonnaise and yellow mustard in a bowl and mix together thoroughly. Set aside. 5. 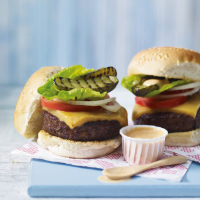 Rub each burger with a little oil and cook them on the barbecue or in a very hot pan, flipping every 15–20 seconds until cooked through. Immediately after the last flip, place a cheese slice on top of each burger and allow to melt for the final 15 seconds. 6. Place the gherkins, cut-side down, on the barbecue for about 90 seconds or until well charred. 7. To serve, place a burger topped with melted cheese on the bottom half of each bun. Add slices of tomato and onions, followed by lettuce leaves, 2 gherkin halves and a little sauce. Cover with the top half of the bun. Great served with a glass of the remaining ale. This recipe was first published in Tue Jul 30 14:28:00 BST 2013.